Scanning camera can be installed inside your cuff in jacket or shirt with high privacy. It is unnecessary for you to put anything else on the table. You can adjust the distance easily by moving your hand forward and backward. The maximum distance between scanning camera and cards can be as long as more than 80cm. The battery can last as long as 4 hours and batteries are replaceable. If you playing Texas holdem and Omaha poker game, you can easy to scan playing cards with poker analyzer, and tell you Who have best hand. How to cheak Bar code marked cards? If you use UV or infrared contact lenses to check the playing cards, you can not see any mark. 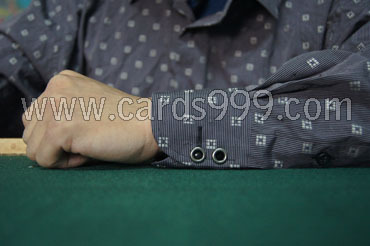 You just to use relatively poker analyzer camera to read invisible ink marked cards. Related words: China poker analyzers, Poker analyzer earpiece factory, Texas holdem analyzer, Poker cheat device, Playing card scanner app.